Kitchen: a charming farmhouse style kitchen with an original pamment tiled floor, painted beamed ceiling and Belfast sink, which is well-equipped with an electric oven, halogen hob, microwave, slim-line dishwasher, fridge and Nespresso coffee machine (with pods provided). Please note that laundry facilities are located in an out-house. There is a pine dining table with four chairs and a door to a staircase to the first floor. Bathroom: There is a step down into the bathroom from the bottom of the stairs. The bathroom is equipped with a new electric shower over the bath, hand basin, WC and chrome heated towel rail. 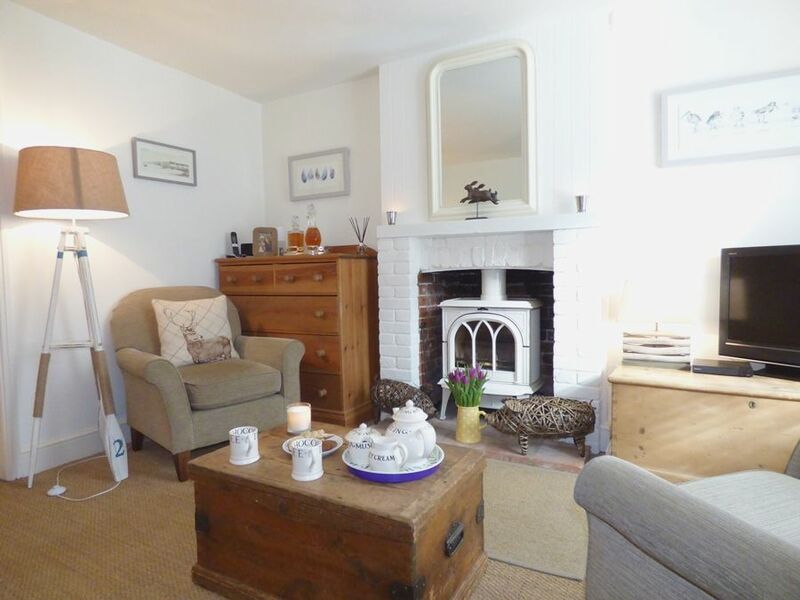 Sitting Room: a beautifully presented room with a newly installed wood burning stove (logs are provided for your stay). There is a sofa and two armchairs, wooden trunk, occasional lamps, TV with Netflix and Amazon Prime, Blu-Ray DVD player. There is a land-line telephone available for use (on an honesty box basis) and free wifi provided. The stairs are a little steep but straight and there is a hand rail. There is a cut off stair at the bottom to accommodate the turn into the kitchen so care should be taken. Bedroom 1: beautifully presented light and spacious room with a cream iron king-size bed, wall-mounted TV, curtained wardrobe, bedside tables and lamps, chest of drawers and ornamental fireplace. Bedroom 2: another lovely room with a double wrought iron bed, chest of drawers, bedside table and lamp. Please note this room does not have a wardrobe although there is a 'ladder rail' to hang things on. There is a travel cot available for use if required. There is a gate from Front Street leading in to the larger than expected private enclosed courtyard garden. The attractive walled garden has been landscaped and has a large rattan dining set with cushions and a charcoal barbecue. There is an out-house at the end of the garden housing a washing machine and tumble dryer. There is no off street parking. There is unrestricted on road parking outside the cottage and in the surrounding area. There is a second out-house containing a table top fridge and separate freezer, together with a supply of logs.